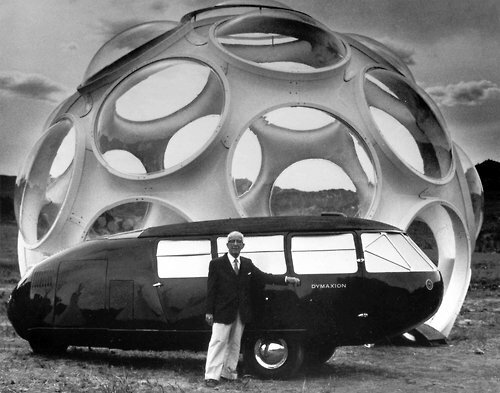 The Dymaxion (dynamic and maximum efficiency) prototype car was designed by American inventor and architect Buckminster Fuller in the thirties. 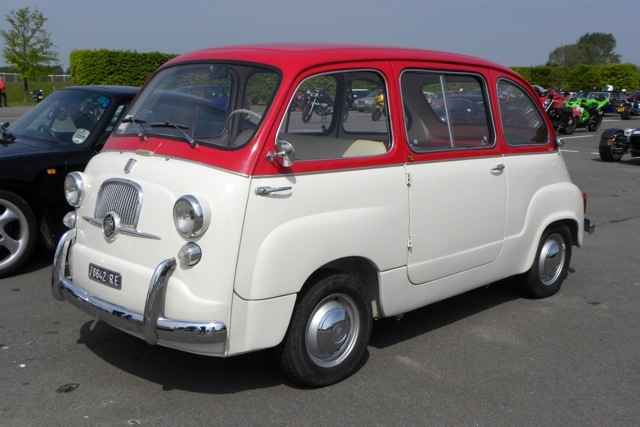 This amazing futuristic vehicle was believed to have been an influence on the design of the Multipla. Only 3 of the three wheeled, streamlined, omnidirectional concept cars were made. Powered by a Ford V-8, Fuller is reported to have driven at 120 mph with a 90 hp engine. A conventional 1933 car would have required, Fuller estimated, at least a 300 hp engine. 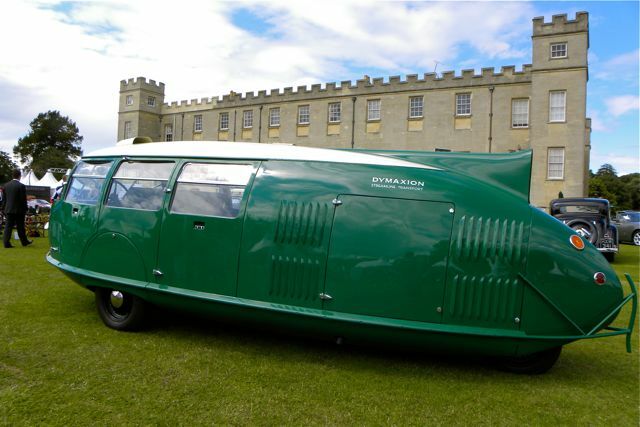 Fuller also claimed that fuel consumption of the Dymaxion car Number One was 30% less than a conventional car at 30mph and 50% less at 50mph. 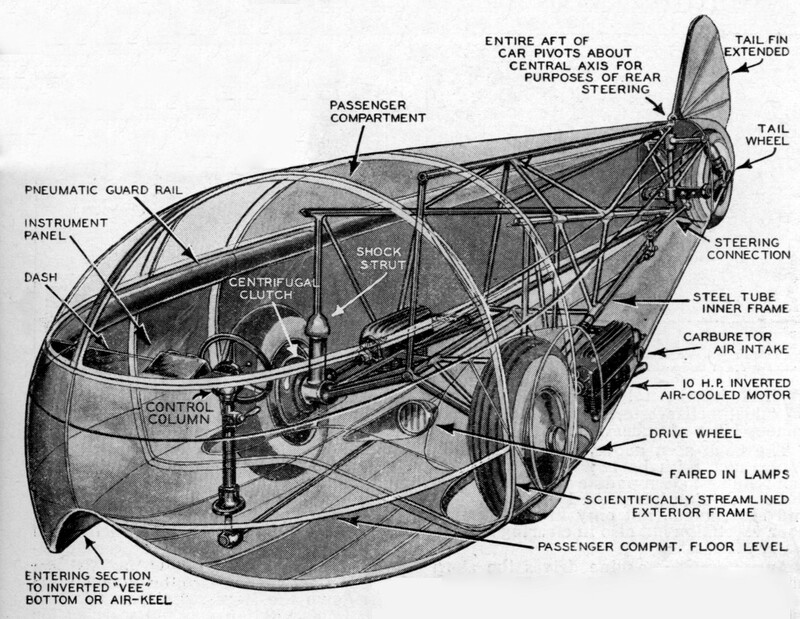 One of the prototypes was badly damaged in a crash at the Chicago World Fair in 1933 which caused Fuller’s investors to pull out so the Dymaxion was never manufactured. Only one of the prototypes survived and is in a museum in Reno. Recently British architect Sir Norman Foster who had worked with Buckminster Fuller and who had always been facinated by the design of the Dymaxion, commissioned Crosthwaite and Gardiner to recreate one. We were lucky enough to see ‘number 4’ at Salon Privé in the summer. Here’s a wonderful video showing the original prototype in action – awesome! 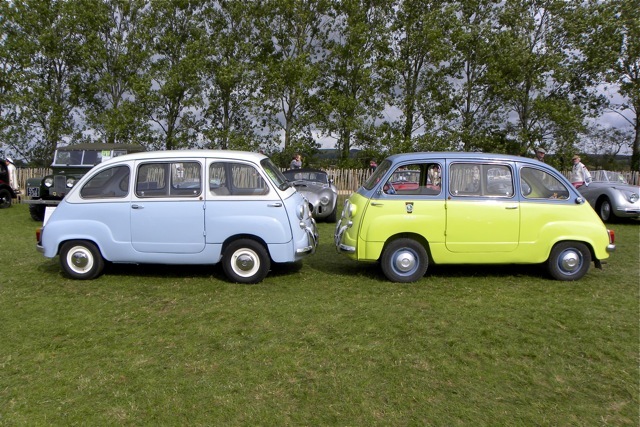 I gather that there was at least four original Fiat Multiplas at the Goodwood Revival this year. A good showing, the numbers in this country seem to be increasing, I guess as their value is increasing it is becoming more worthwhile to invest in restoring one. The collective noun for a group of Multiplas must be a ‘multitude’! 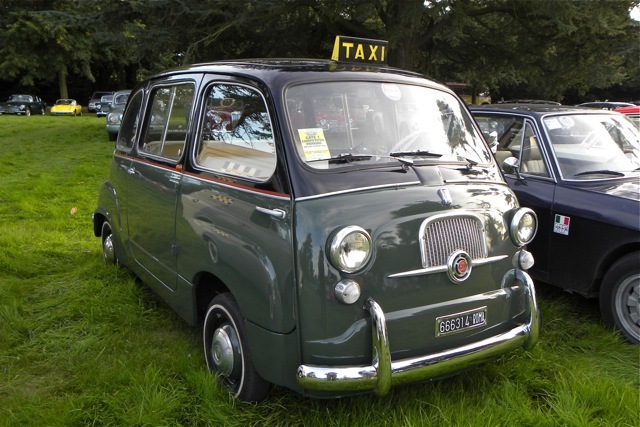 Firstly we had this lovely Italian registered model in Rome taxi livery complete with a taxi meter and sign. This was spotted at the pre-revival cricket and in the paddock during the weekend so it was a team support vehicle, unfortunately we never got to meet them. Several of our friends spotted this red and cream version in the pre-73 car park. We met this car earlier in the year at Breakfast Club as pictured. The car comes from Italy where it’s human lives for part of the year. It is currently residing in Portsmouth so we should see it quite often. Finally although we didn’t get to chat this year was Mario’s friend ‘Luigi’ who was on Lavant bank on the Sunday. Luigi’s humans have been great fans of Mario for many years and were delighted when they found Luigi a few years ago. The picture shows Mario and Luigi getting together for the first time on Lavant bank at last years Revival, they make a great pair. 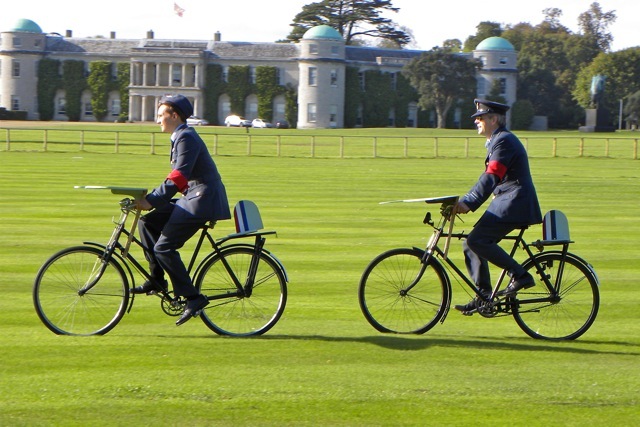 Did you see the Baker Street Boys at the Goodwood Revival? 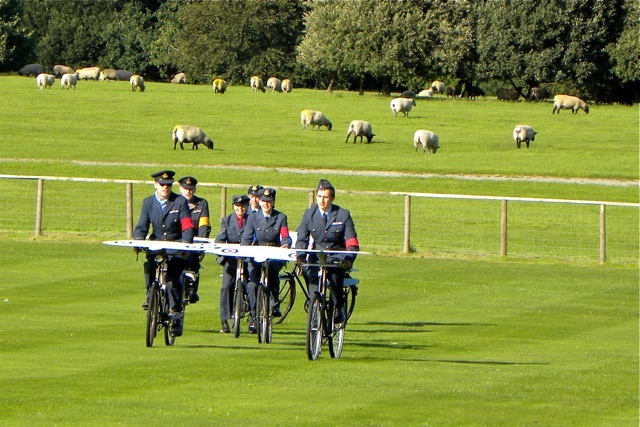 This RAF Bicycle display team recreated aircraft formation training exercises that young pilots completed in the second World War before they flew actual aircraft! 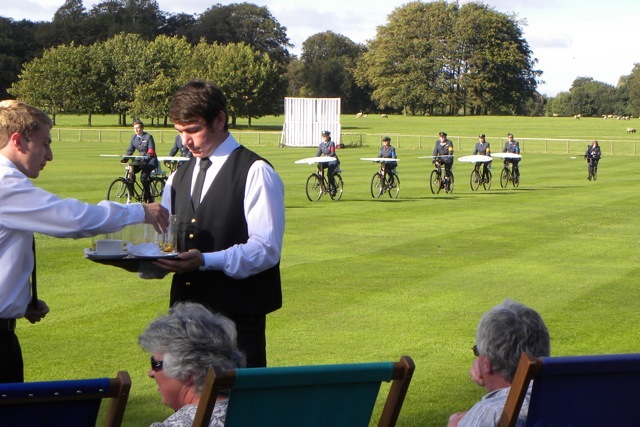 Using authentic bikes with wings attached the ‘Baker Boys’ were a great attraction, pictured here during tea at the Thursday cricket match they also performed on the track between races.